Currently my title is “Technology & Instructional Design Librarian” but that doesn’t really tell you what I do. I take care of all instructional design, instructional technology, and student/faculty technology training. I’m the administrator for our learning management system and our video hosting platform. In addition to those things, I do instructional coaching, help program directors make sure their online programs are of high quality, do reference work for students as well as helping to plan the library budget alongside our collections management librarian. I also did most of the work to establish our new library website. Now that it’s built, we all co-manage it (which means when someone remembers something needs to be done we take care of it). I was a school librarian for 2 years right after my undergraduate work. I completed my Master of Library Science as I was working as a school librarian. I then took jobs outside of librarianship for 3 years, and now have been in my current position for 3 years. So I guess you could say on and off for the past 8 years. I’m told my office was a complete afterthought when they built this part of our library. They were near completion when the library director at the time told the construction team we needed another office. So they essentially put up 2 walls and a semi-circle of glass windows, fixed a countertop to one of the walls, and called it an office. 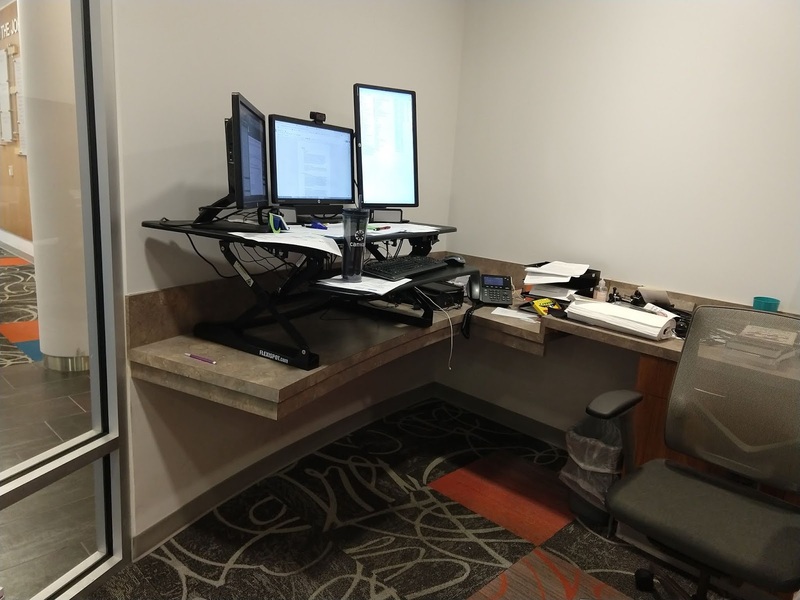 I refer to it as my “fishbowl.” The countertop isn’t really the right height a desk should be and the edges are not smooth so it’s kind of uncomfortable to work at. 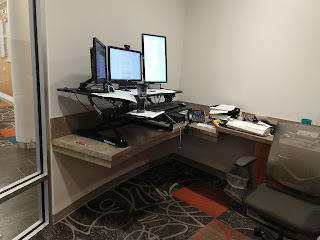 Because of that, I asked my boss if I could get one of those sit/stand things you put on your desk and I like it a lot better. I try my best to be paperless in my work but there are still a bunch of papers all over the place. There’s also A/V equipment sitting out because I often forget to put things away. I’m ruled by my calendar. I have a Google calendar widget on the home screen of my phone. It’s typically the first thing I look at when I wake up. I like to know the quantity and type of meetings I’ll have before I even get in the shower. A lot of my time is spent in meetings, consultations, or trainings, so it’s important to know what I have going on and what I can possibly fit in between those meetings, etc. Many people I’ve talked to about work-efficiency type of stuff tell me that it’s bad to be ruled by your calendar because you’ll take too many meetings, but I actually book time on my calendar to work on “real” work. For example, today I had 2 hours blocked off on my calendar to work on some video tutorials I owed to some students. If someone wants to schedule a meeting with me, it looks to them that I’m already in a meeting for those 2 hours so I actually get the time to do my work. Other than that I don’t know that my days are really organized. Every day is different for me based on who needs to work with me. Faculty and students all have their class schedules pretty set so it means I have to be the flexible one. Listening to music. I’m serious with that too. I keep Pandora going pretty much all day every day except for when I have a meeting. I have pretty sweet stations centered around Eminem, Macklemore, Jay Z, Taylor Swift, Demi Lovato, a station that mixes Jesus Christ Superstar with Les Miserables, a good Simon & Garfunkel station, and sometimes I even mix in the Disney station I have for my kids. As far as what I spend my time doing with the music on, it certainly feels like I spend most of my time answering tech questions and making video tutorials because words don’t always do the trick. However when I look at my calendar there’s no way my feeling there is accurate. Most of my time is spent working with faculty to help them teach better (face to face or online). I’m going to split this into 2 sections. You’ll see why when you get to the 2nd part. After waking up, I check my calendar for the day, get a shower, get dressed, and make empty threats to ground my children or take away their toys if they don’t get ready for school. At work I make it a point to greet my coworkers right when I get in. Some of my coworkers come in after me and I make sure to say hi to them later on. When I get to my office I check my email. I try my best to answer everything that can be answered in a few words or sentences first. I figure it’s better to get the easy ones out of the way. Then I work on the rest whenever I have time. I’ve found that, especially here, if you answer emails quickly people are super-appreciative because there are other people that take forever to get back to people. Solving problems efficiently makes you look like Superman if everyone else will wait a few days. Besides the email thing, like I said before it’s all about my calendar and no 2 days are the same. I get in the car with my wife (we work together and often drive together) and unless she brings something up, I don’t even think about work. It’s as if there’s an ocean between my house and the college. I used to be a work-a-holic. I used to answer work emails whenever they came in. Then I realized that I’m not an Emergency Room Surgeon and nobody’s going to die or be harmed in any way if I let those emails wait until the next morning. My boss and many other people on campus have my cell phone number and personal email. If it’s super-important, someone will find a way to contact me. I’ve been working through the “Jack Ryan” series via audiobook for what I’m thinking is the last 2 years I listen when in the car by myself and when I run. I typically run between 20-45 minutes and, with 3 girls and a wife, I’m hardly ever driving by myself - so it’s slow going. I’m currently on Command Authority. First...It is perfectly fine to say “I don’t know right now; give me a few days to think about it.” I know seems to go against what I said earlier with solving problems efficiently, but the right answer after a few days is more efficient than a wrong answer right away. Second, and more importantly… Family comes first. Never lose sight of your family to get ahead at work. I never expected people from other departments (including faculty) would ask me for advice with stuff that has little or nothing to do with my job description or duties. I totally welcome it, as I will help in any way I can, but I definitely didn’t expect it. I usually end up running things by them that I’m wondering about, too. It’s pretty good brainstorming and we’ve all benefited from it. Jobs that involve being covered in poop or other undesirable substance. Pretty much anything on that Dirty Jobs show. Time travel--I’d go forward to get lottery numbers and then come back to win a gazillion dollars. I’d only even have to use the power once. I wouldn’t want to mess with something crazy in the past and end up with dinosaurs still roaming the Earth. What are you most proud of in your career?I’m most proud of my diversity of talents. This particular job has me doing a bunch of different things on top of the other things I’ve been good at in prior jobs. Each of the 3 prior jobs I’ve had have been very different from one another. School librarian, classroom teacher/football coach, project manager at a manufacturing firm, and now the litany of things I do as a librarian. I think it’s cool that I’ve been able to have so many experiences. This was back when I was a project manager at a manufacturing firm. I took a meeting with a client’s architect and some others at a time when my engineering and design team was unavailable. I thought I could handle it myself and I was wrong. I ended up wasting everyone’s time in the meeting. It’s kind of like I said before with saying “I don’t know”. It’s better to delay the meeting than it is to have a meeting with the wrong people. There’s really only 3 possibilities. I’m either doing something with my kids, bringing my kids to their activities like dance and soccer, or playing Playstation. After the kids go to bed you can find me working on my MBA coursework. I have 2 more semesters. Scott DiMarco, Mansfield University of Pennsylvania. He’s one of the best men I know and I think we could all learn a lot from him. He tweets sparingly at @James_Dann2006.